With qgit you will be able to browse revisions history, view patch contentand changed files, graphically following different development branches.Bugs or feature requests should be sent to the git@vger.kernel.orgmailing list.Main features------------- - View revisions, diffs, files history, files annotation, archive tree. - Commit changes visually cherry picking modified files. - Apply or save patch series from selected commits, drag and drop commits between two instances of qgit. - Associate commands sequences, scripts and anything else executable to a custom action. 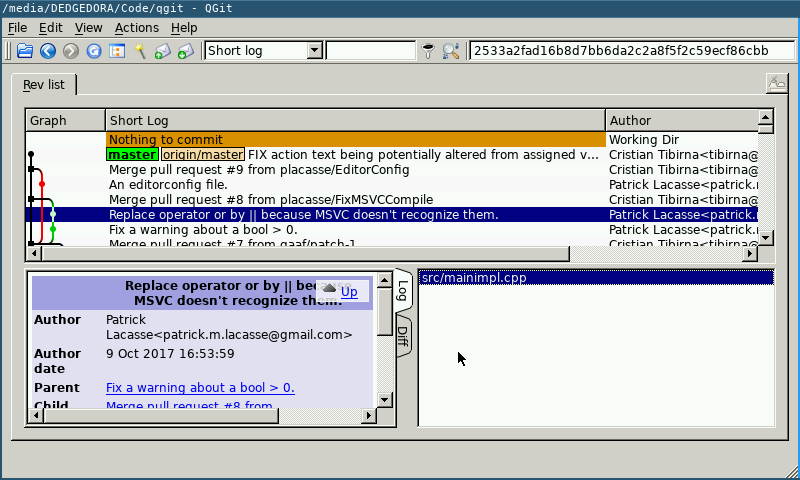 Actions can be run from menu and corresponding output is grabbed by a terminal window. - qgit implements a GUI for the most common StGIT commands like push/pop and apply/save patches. You can also create new patches or refresh current top one using the same semantics of git commit, i.e. cherry picking single modified files.